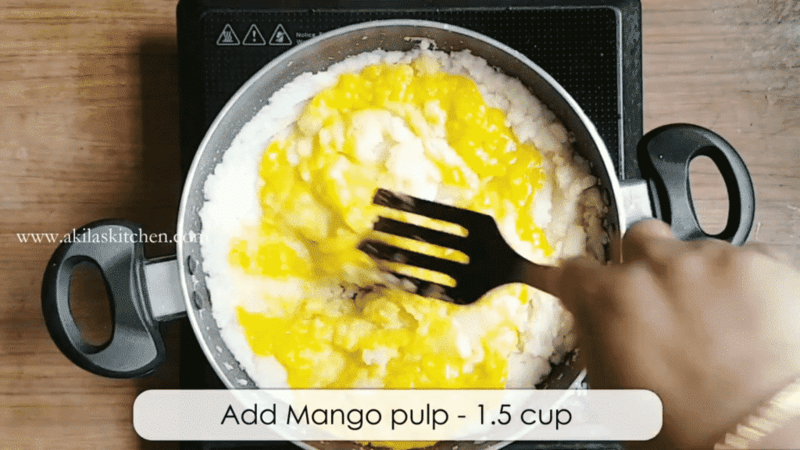 Mango Kesari | Mango Sheera | Mampazha Kesari Recipe with video and step by step instructions for easy learning. 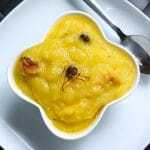 Mango Kesari | Mango Sheera | Mampazha Kesari Recipe is a tasty dessert which is prepared during festival times or as an offering to God. The blend of mango, rava and ghee makes it mouth watering. It can either be eaten cold or hot. In both ways it tastes good. But I always prefer to eat hot just taken out from stove. 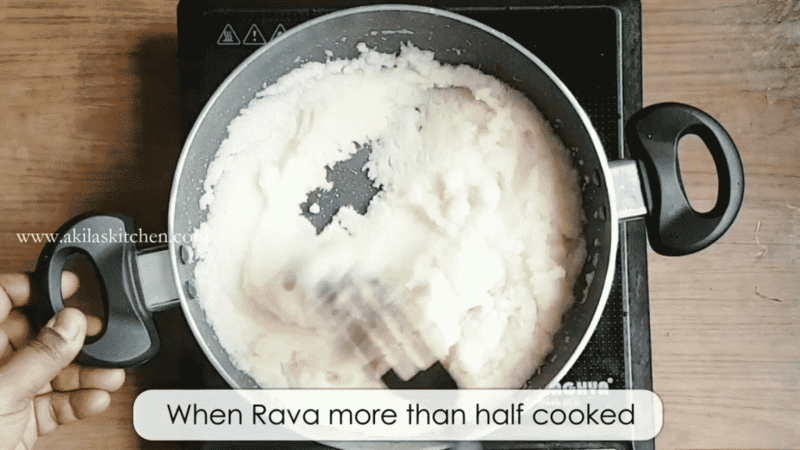 Care should be taken while cooking rava Because they should be more than half cooked before adding the rava so that rava gets cooked properly and if you add the mango pulp early you will not get the correct texture of mango halwa. If you like you can check more Mango Recipes here and more Easy Indian Sweet Recipes. In the heavy bottom pan and 2 tablespoon of ghee. 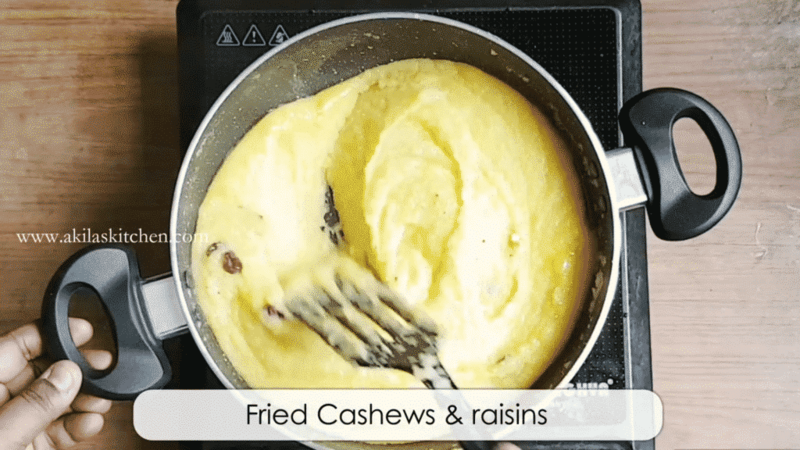 Add cashews and raisins and fry for 1 to 2 minutes. Fry till the raisins bulge and cashews becomes light golden in color. Remove and keep aside. 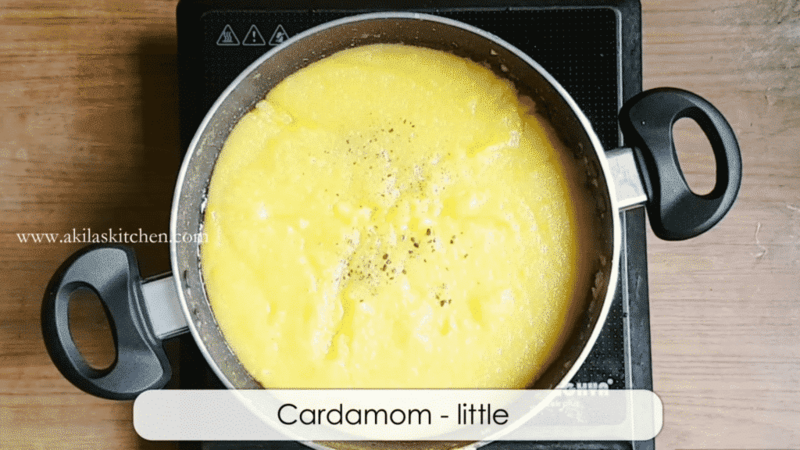 In the same pan add one cup of rava (semolina) and fry it, till it becomes light golden color. Do not overfry it. When it is done remove it from the pan, and keep aside to cool down. 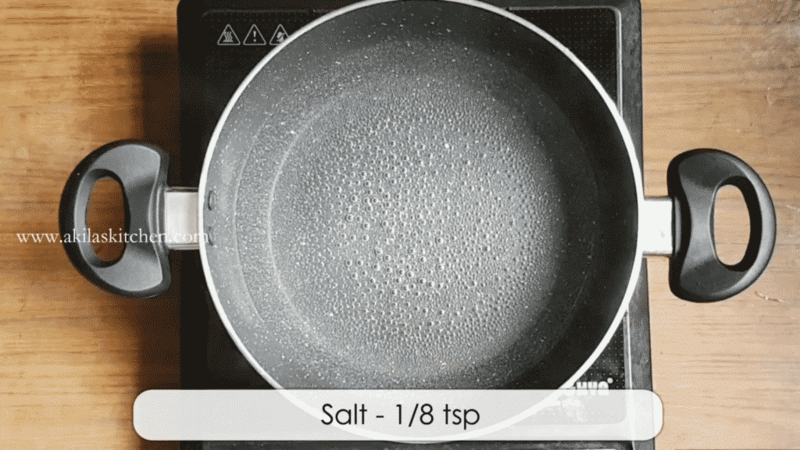 Now add 3 cups of water to the vessel and little salt and allow it to boil. When the water is boiling add the rava little by little and cook until it is more than half cooked. Now add one and a half cups of mango pulp and mix well. 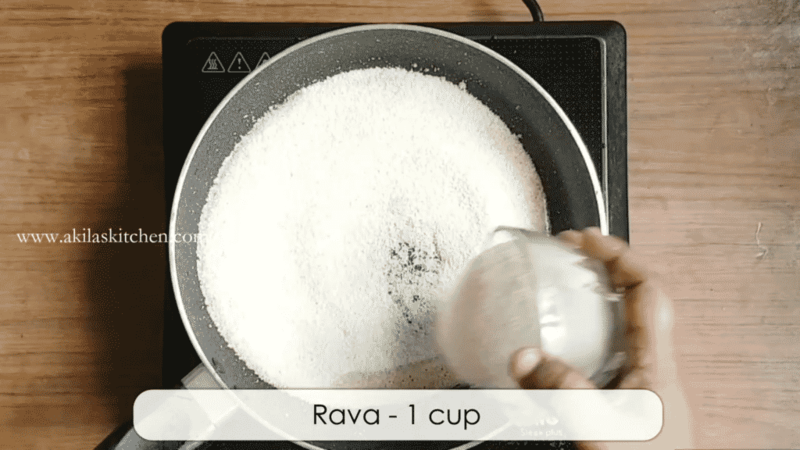 The mango pulp must be added after the rava is mostly cooked up because if we add before Rava gets cooked, rava will not get cooked. So always add the mango pulp after that is cooked. Now add the sugar and mix well. Cook until the sugar gets dissolved fully. Add the cardomam powder and mix well. Add the fried cashews and raisins. Garnish with some saffron and serve it. 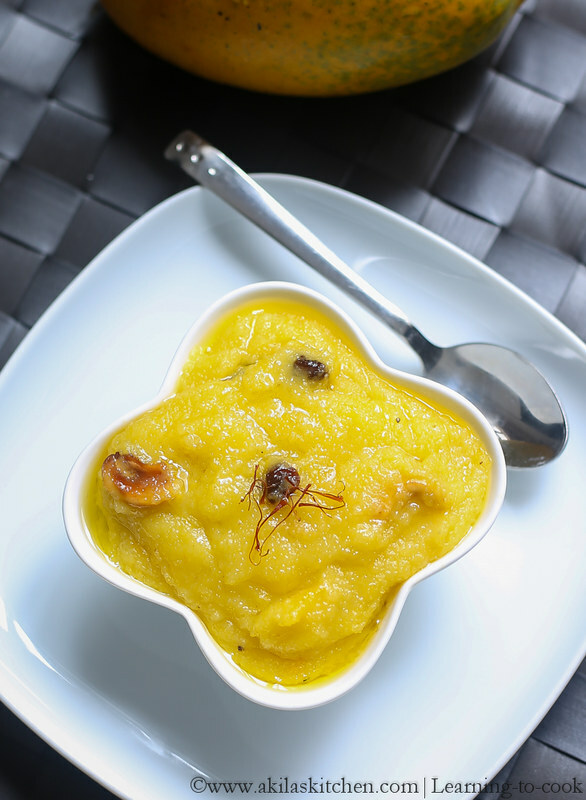 Serve the Mango Rava Kesari hot or cold. 1. 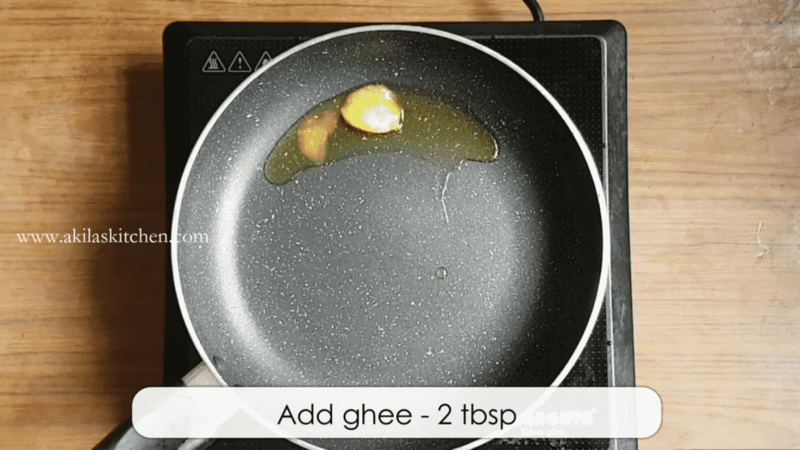 In the heavy bottom pan and 2 tablespoon of ghee. 2. 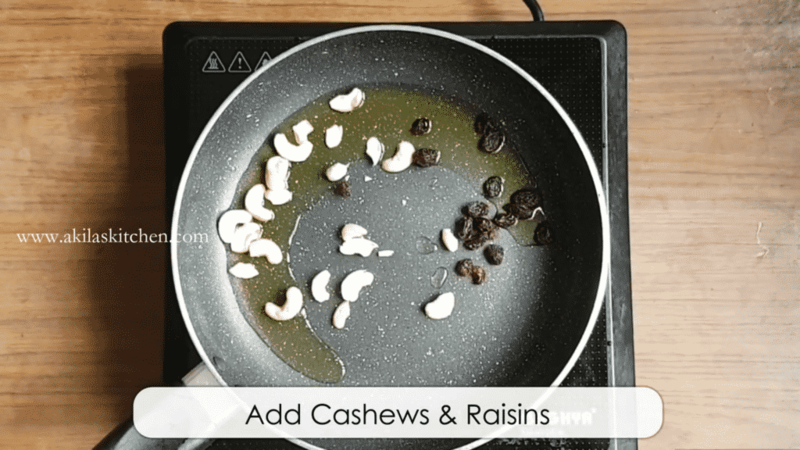 Add cashews and raisins and fry for 1 to 2 minutes. Fry till the raisins bulge and cashews becomes light golden in color. Remove and keep aside. 3. 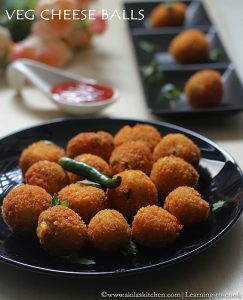 In the same pan add one cup of rava (semolina) and fry it, till it becomes light golden color. Do not overfry it. When it is done remove it from the pan, and keep aside to cool down. 4. Now add 3 cups of water to the vessel and little salt and allow it to boil. 5. 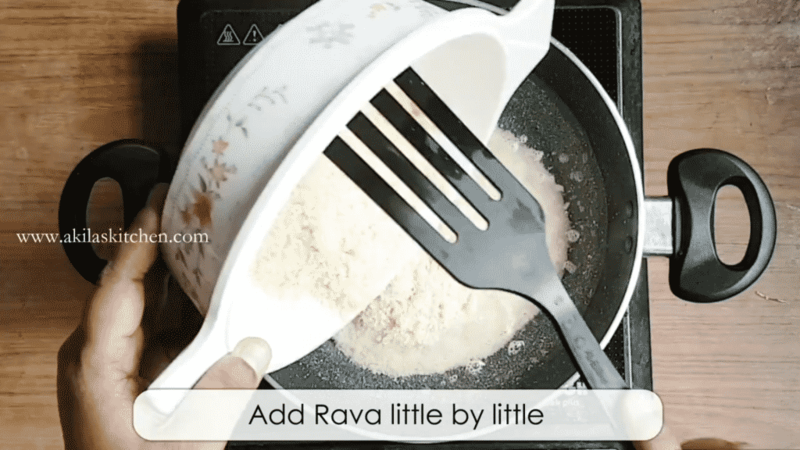 When the water is boiling add the rava little by little and cook until it is more than half cooked. 6. Now add one and a half cups of mango pulp and mix well. The mango pulp must be added after the rava is mostly cooked up because if we add before Rava gets cooked, rava will not get cooked. So always add the mango pulp after that is cooked. 7. Now add the sugar and mix well. 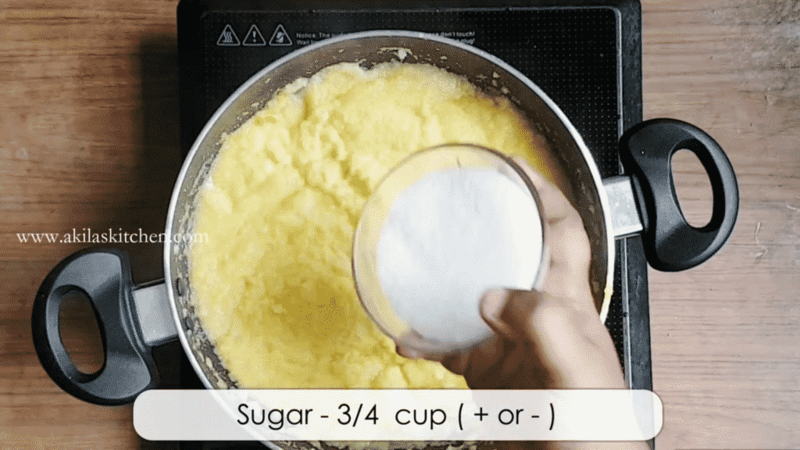 Cook until the sugar gets dissolved fully. 8. 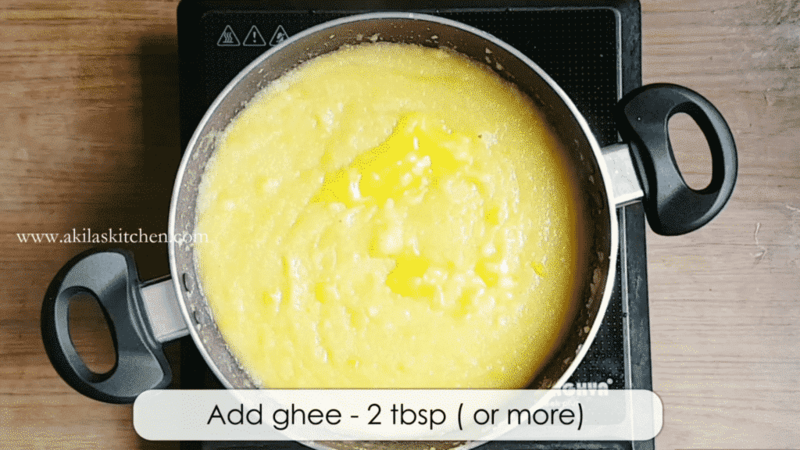 Add the remaining ghee. 9. Add the cardomam powder and mix well. 10. Add the fried cashews and raisins. 11. Garnish with some saffron and serve it. 12. 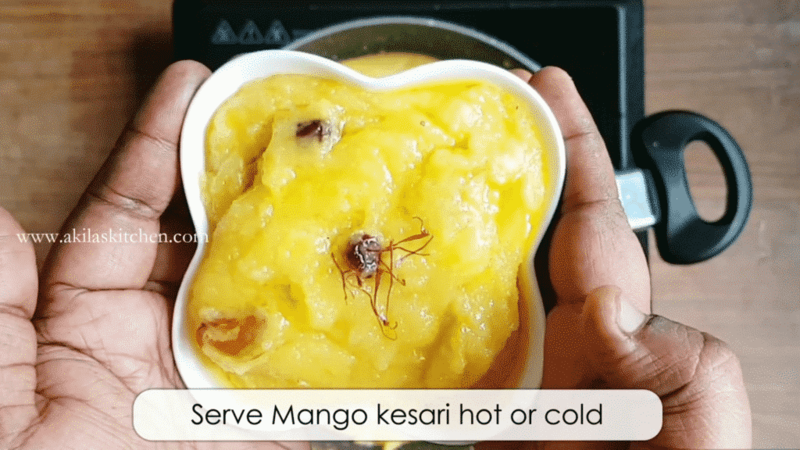 Serve the Mango Rava Kesari hot or cold. Remember always add the mango pulp after the rava is mostly cooked. You can increase or decrease the sugar as per taste. 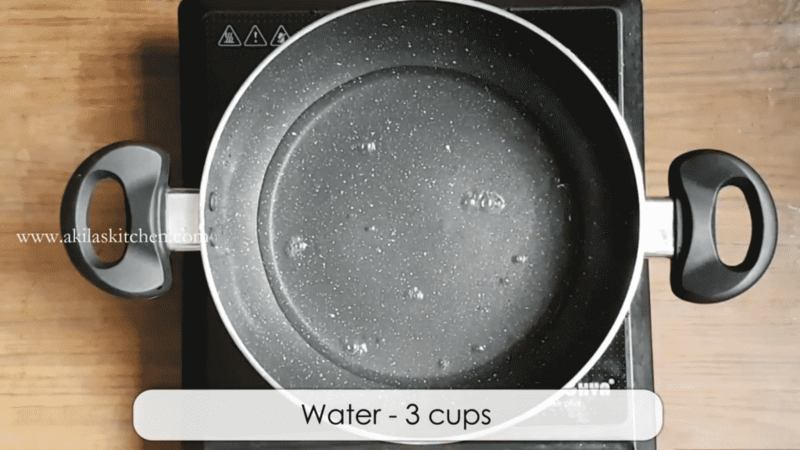 This recipe needs water nearly 4.5 cups to 5 cups of water. so I have taken 3 cups of water and 1 and 1/2 cups of mango pulp. If you want to add more mango pulp you can add it. You can also add mango Essence if you want. If you want you can soak little saffron in milk and add to get nice color.